I LOVED all the stories you shared in the comments of yesterday’s post. They were awesome and some had me laughing! Thanks so much for those! 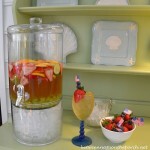 Yesterday I shared some pics of a yummy party beverage I made on Sunday for a porch party with friends. 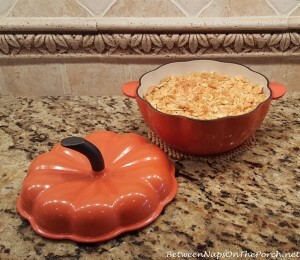 Today I’m sharing the recipe, including a printable copy below. Note: The Sangria looks a little darker in this picture than it does once it’s served because just before you serve it, you add a bit of club soda. The Club Soda gives it that extra zip that makes this beverage even more refreshing for summertime. I have to confess, I’ve never like Sangria because all of the Sangria drinks I’ve tasted before reminded me of cherry flavored cough syrup. Yuck. This Sangria is nothing like that at all. In fact, that’s what drew me to the recipe; it was touted as being totally different and not sicky sweet like most Sangrias. I’m not sure if the ice in the lower part of the server I used helped to keep the beverage cold or not. It melted pretty quickly so I doubt it helped to keep the Sangria cold. If you have a beverage server like this one, you may just want to put something decorative in the bottom part, like lemons and/or limes since this drink gets served over ice, anyway. 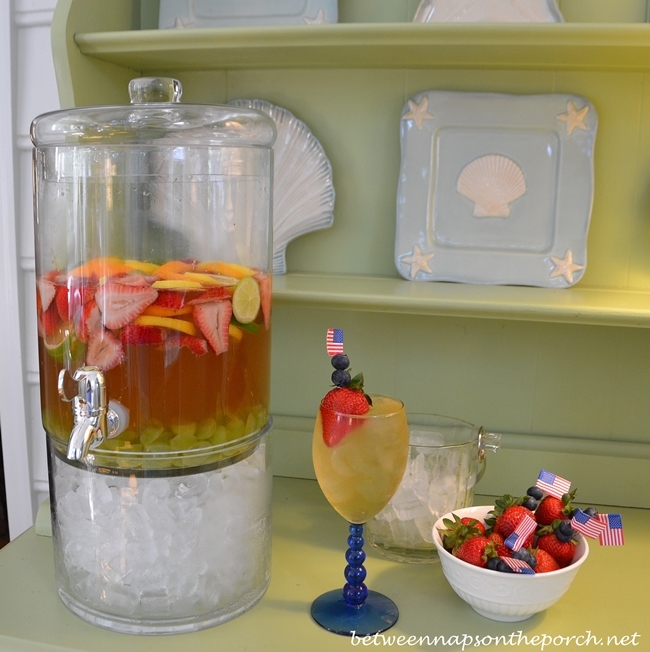 Also, for smaller gatherings where you’ll only be making one or two batches of this beverage, you will probably want to serve the Sangria from a pitcher. I mixed up 4 batches at once and we had already filled our glasses by the time I took the photo below…so that gives you an idea of how much it takes to partially fill up a large beverage server. If you have any questions about this recipe, just let me know. It comes from a book I purchased while touring historic homes in Louisiana and Mississippi. I’ll be sharing the name and some information about the book this evening in a BNOTP Library post because it has fast become one of my faves. That post will go up around 7:00 PM this evening. Update: I had a great question about when to add the club soda. The recipe says to serve the Sangria over ice and to “top off” the glasses with the club soda. I’m guessing they have you do it that way so it will be nice and fizzy. You definitely would not want to add it in the night before when everything else is mixed up because it would be flat by the next day when you would be serving it. It may be okay to add the 2 cups of club soda into the batch right at serving time. But if in doubt, just follow the recipe exactly and add to the beverage in the amount desired when serving. 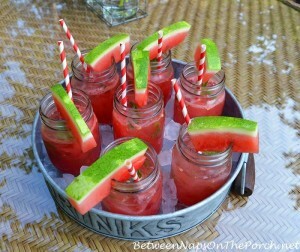 This drink is great for a summer party, especially one outdoors. 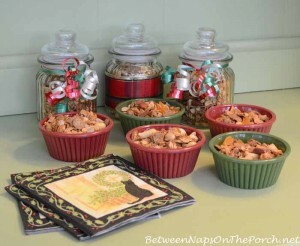 It's cool and refreshing, not too sweet and your guests will be coming back for more. 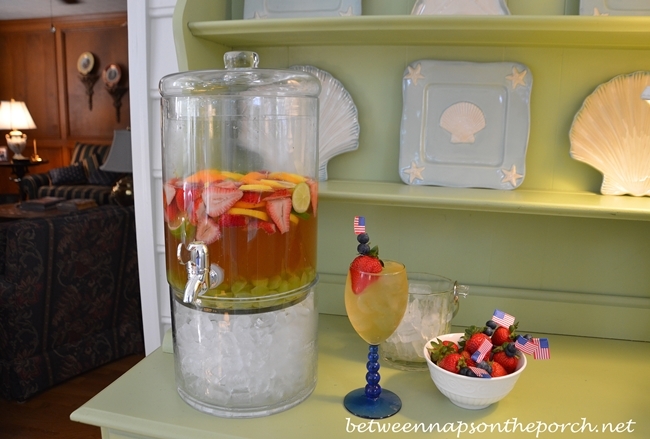 Combine the wine, liqueur, sugar and fruit in a large, clear pitcher or beverage server. At serving time, pour into cocktail glasses filled with ice and top off with club soda. Garnish with strawberries by slicing them part-way up from the bottom and place on the rim of the glass. Or, just spear a couple of blueberries with a decorative toothpick, then stick that into the strawberry and place it on top of the ice in the glass. That's how I garnished mine. The blueberries add a bit of blue for those patriotic holidays. Pssst: You’ll find more recipes under the “Recipe” category here at BNOTP, including some additional great party-beverage recipes. Thanks for answering my request from yesterday! I make your champagne cocktail at Christmas and get raves! Thanks Denise! There was a typo in that recipe…supposed to be 1 bottle of wine, not 7! I just changed it so you may want to reprint it. Carolyn, there was a typo in that recipe…supposed to be 1 bottle of wine…not 7! I just changed it so you may want to reprint that. I hate to share this with you, but I just tried to email reply you back from the email that you sent to me … it returned: Mailer-Daemon. : / As in, you don’t exist, they couldn’t find you. I even teased: I got this email!! But I know you didn’t get my response and thank you. The gremlins are still at work, I’m afraid. Yeah, Unfortunately, I don’t think these email plugins that work with WordPress are designed for replys back. The techy folks who help me with my blog just fixed it last night where it will at least notify someone if I reply to their comment, but I’m not sure it can be coded where someone can reply back. Sorry about that. Or not … depending on the crowd! lol!! Yay! So glad to hear that! Marlis, I had a typo in that recipe…it’s 1 bottle of wine, not 7! lol I just changed it in the recipe. Do you really mean seven bottles of wine? Wish I’d been at your house to have had some of this! 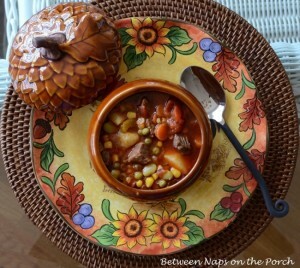 Thanks for the recipe and I may have to try making something similar! Your refrigerator disaster with the sangria had me saying some curse words for you. HA! Had to be such a mess…so sorry. It’s always something isn’t it?! This may be a dumb question, but did you pour all the club soda in the beverage dispenser right before serving, or did you top each person’s glass with a little bit of it as you served? If it’s the latter, about how much club soda did you put in each glass? Uh, needless to say, I’m a bit of a novice at these things. That’s a great question, Kathy. The recipe didn’t specify…just said to top off each glass with the club soda. At first I thought I would add it to the whole batch but since the directions said to “top off the glass” I just put the club soda beside the server and let everyone add what they wanted. If I make it again, I may go ahead and add it directly to it. I bet the recipe suggests adding it to the glass because they may be afraid folks would pour it all in when making the recipe the night before, then it would be flat the next day when serving it. If the club soda was added to the whole container right before serving it for the party, it would probably still be zippy and not flat. What do you think? This recipe looks like a really good one for Sangria with white wine–I think I’ll try it for a future party. When hubby and I travelled through Spain a few years ago, we noticed was that every restaurant/bar had pitchers of red Sangria sitting on the bar counter, ready to be served in an instant. It was very charming. We actually consumed no other alcoholic beverage besides Sangria while we were in Spain. Thanks again for sharing your recipe. Have a great day. I would love to travel there one day! What a fun trip that would be! That post sent before I was finished “editing.” : / I know to begin sentences with capital letters but this osteoarthritis …. I will look on the website for that champagne cocktail Denise mentioned. Thanks for all the fun, Susan!! Thanks for the great recipe. We are all Sangria vans here, so I will give this a try when I host my sister’s birthday dinner. Let me know how you guys like it, Mary! It’s the only Sangria recipe I’ve ever liked. This Sangria looks wonderful Susan! Thanks, I love it! I have a recipe I have used for a many years that we love…it packs a bit more “punch” than the one you found, but still refreshing. Just be sure your guests have a way to get home safely afterwards… This was served at my wedding as ‘punch’. The secret is Champagne. Yes, instead of adding Club Soda before serving, top off with a little bit of chilled Champagne. Seven bottles of wine and I would not have cared whether the dishes were done or not!! I will try this one soon, thank you!